"The loudspeakers you don't hear"
are a new aproach, based on study of human hearing. After a decade of development, they now address all known detection mechanisms in the human ear and take into account the way our brain deals with aperiodic sounds in reverberant environments. This results in an ability to communicate both periodic and aperiodic sounds in a stunningly realistic way to the human hearing system, and additionally to reduce listening fatigue. "Like when TV went to color, but then for Sound"
LEGEND Precision Sound Reproducers are not just excellent or of better quality. While of course they are, they more importantly present new and uncommon features that you can hear immediately. Like a black and white television set does not address the color-sensitive cells in your eyes, traditional loudspeakers generally do not address two of three detection systems in your ears, and don't take into account the way the brain deals with sound in reverberant environments. When you first discover LEGEND Sound reproducers the experience can be compared to seeing a color TV when before you were used to black and white units only, and thought that these were the best that ever could be achieved. The discovery can be surprising, it can sometimes even be slightly disturbing for a short while. But once you become used to it, which usually happens all by itself, and in a short time, it is going back that might eventually be dissapointing, as the results are rich, pleasing and exciting, while at the same time they require less effort to listen to. The human ear has three known detection mechanisms, two of which work in the time domain. Traditional loudspeaker systems usually do not address these and talk to the detection that recognises pitch and volume only. We then can recognise the reproduced sound but we also note the sound is not ‘real’, it is not happening in the room and misses information. Our brain will then fill in the gaps from memory, which in turn creates ‘listening fatigue’. The LEGEND systems correctly address all three detection mechanisms allowing for sounds to appear ‘real’, detailed and complete, and for the listening experience to feel natural and relaxed. The best room compensation system in existence is the one built into our heads: our brain. But for this natural system to work well, sound must be radiated in a way the brain is used to. Most natural sound events, like when an object hits the floor, are pulse shaped, omnidirectional and have their origin in a small area. LEGEND systems are pulse correct virtual point sources. All sounds emitted originate from the same small spot, that radiates the same way in all directions. Now the brain can deal with the reflections in the same way it does in daily life and relax, while with traditional speakers it must transform, correct and adapt. The radiation pattern of a LEGEND Sound Reproducer is not intended to imitate that of a musical instrument. It's intention is to transmit information to the human ear and brain in such a way that our hearing system can deal with the reverberations in the listening room in the most natural way, so that it can recover and appreciate the recorded signal. This will then subsequently allow our brain to reconstruct the sonic space of the recorded environment. Except for bass (room modes) no room compensation or special acoustic treatment of the room is needed as the brain will now deal with the reflections naturally. LEGEND Precision Sound Reproducers not only reproduce tones and notes (periodic sounds) beautifully and with high precision, they also reproduce noises and events (aperiodic sounds) with high fidelity, so these also sound real. This is something that is lacking in many traditional speakers. With event sounds and noises we mean sounds like clicks and clacks, a closing door, putting a teacup on the table or the sound of an object falling on a hard floor. With traditional speakers we can recognise these sounds but we also note that they are not real, not like if they were really happening in the room. When you hear the sound of something falling on the floor you never doubt if the sound came from a loudspeaker or if something actually fell in your room. With Legends this is different: events do sound real. In fact, human ears have specific detection mechanisms for the detection of aperiodic sound events or for hearing tones and timbres (periodic sounds), and the brain has specific ways to deal with these sounds in reverberant environments. Traditional loudspeakers usually do not take this into account and often only concentrate on the reproduction of tones and timbre. Music, however, is also full of non-periodic events. This is much true for percussion but also the onsets of many tones are perceived by the 'aperiodic detection systems' of our ears. Not addressing these could be compared to showing black and white pictures in stead of color. Earlier attempts to address the aperiodic detections in the ear often generated comprimises in tonal reproduction. Not so with Legends. The ability to reproduce tones, timbres and dynamics have been taken care of uncompromised as well, at the highest levels possible today. LEGEND Precision Sound Reproducers are sometimes called ”The Loudspeakers you don't hear” because they add so little to the signal that you only hear the recorded sound, and not the loudspeaker. They do not add a 'footprint' to the signal. Additionally, the virtual point sources create a floating sound image so convincing that it seems as if no sound is actually coming from the speaker units themselves. A 3D cloud of sound is appearing in the room, between the units and the units themselves actually seem to be silent. Both these characteristics resulted in the use of the phrase ”The Loudspeakers you don't hear”. Amplification needed Power amplification is built-in. The units connect to a pre-amplifier output. Power supply type Toroidal transformer, high grade capacitors and regulators. Dual, Symmetrical. Q: If a system is tested to reproduce all frequencies then all sounds will be reproduced correctly, no? A: Not necessarily. Testing a sound reproduction system with just sine waves is a bit like testing a car on a straight track without ever using the wheel or the brakes. Most natural sounds and also music include lots of impulse shaped waveforms. They are not sinusoidal per se. To reproduce impulse shaped sound events correctly, all frequency channels must work in perfect sync with equal delays, in phase, and do so in all directions. They also need to originate all from the same spot or else the reflected sounds will still have their shapes changed. And also transient distortion needs to be absent for impulse shaped sounds to be reproduced undamaged. Sine wave tests do not test or measure this. Q: It has been demonstrated that the ear is phase deaf. Why do you bother about phase-linearity? A: These demonstrations used continuous (steady state) sounds. On steady state tones only one of three detection mechanisms in the ear is active, and indeed, that one, the basilar membrane, does not detect phase. Two other detections are active on the onset of a sound. Phase errors are detected quite well at that time. This is because phase inaccuracies damage pulse shaped waveforms. The result of damaged onsets is lack of realism, a poor sound stage, a narrow sweet spot, sounds not staying sparate, and listening fatigue. Only timbre, volume and pitch are not influenced by phase erorrs. Q: Can you tell a bit more about these sound detection mechanisms in human hearing? A: We have three sound detection mechanisms. When a new sound is perceived these work sequentially. The first detection is used for direction detection. Only time is measured and only the very first pressure change is considered. Strength or pitch are not considered here. Time difference between the two ears provides information about where the sound is coming from. The second analysis measures the time between the beginning of the sound and the moment when the air pressure passes the zero point again. This also is a time measurement only. It provides information about the size of the object that produced the sound. When both these time measurements are completed, the evaluation of pitch, timbre and volume will start, using the basilar membrane. Q: Is this new? How come I never knew about this? A: Altough the human ear did not change recently the knowledge about it did. But it also is not so very new as this knowledge is now almost 30 years old, and the expectation of the existence of such mechanisms is even older: We know for much longer that we can estimate direction precisely and with the basilar membrane mechanism only, this could not be fully explained. The legacy loudspeaker concept does not take this 'new' knowledge into account. Indeed, the basic principles of many of todays loudspeakers are still similar to those designed 70 years ago. Tradition can be hard to beat and one could wonder why some consider a 70 year old loudspeaker concept to be still apropriate today, while the concepts of radios, TV's, telephones, and cars from that period are now charished for by collectors and museums. Q: You have presented LEGENDS at High End audio shows. How do they compare to High End HiFi systems in general? Q: I learned that sound reflections should be eliminated as much as possible. Why are your speakers radiating all around instead? A: Most traditional loudspeakers radiate unbalanced sound from the sides and from the back of the unit. The reflections of these you will want to try to eliminate indeed. But reflections from time-correct, and well balanced sound are actually an advantage to the listening experience: Human hearing is perfectly at ease with reflected sound during daily life and also when listening to live music. Traditional loudspeakers, however, create challenges to the way human hearing deals with reflected sound, as the compromised sound coming from the sides or from the back creates a challenge for the brain in linking the reflections with the corresponding direct sounds. Reflections resulting from a coherent source to begin with, as those coming from an original sound event, from a musical instrument or from a LEGEND omni point source speaker, will be easy to link for the brain, and will therefore not disturb. It will actually enhance the listening experience as it will allow our brain to work naturally as a room compensator and reconstruct the original source signal. Heavy room treatement will not be needed with LEGEND's. Q: What is ‘transient distortion’ and why is it so important to avoid it? A: Transient distortion is distortion caused by the inertia (mass) of driver membranes and driver assemblies. When a loudspeaker reproduces a sine wave, the mass of the moving parts is not a problem as they oscillate like a string does. Now imagine you pull the signal plug suddenly. The oscillating membrane will not be able to stop immediately and will continue to produce some movement (and sound) for a short while before it comes to rest. This is caused by stored energy. Energy can be stored in the speed of moving mass and in springloads of the membrane suspension. As a result, sound is produced that was not present in the signal. In musical signals sudden changes happen very often. We call them transients. Traditional loudspeakers often produce significant amounts of this spurious sound, masking real information and causing listening fatigue. This is then felt as ‘aggressive’. It damages pulse shaped waveform information, impairs realism and sound stage. It is a prominent problem in traditional loudspeakers, and the absence of it is already well known as a specific quality of electrostatic loudspeakers. Vynil disks by design contain less transients and therefore often are considered less agressive than digital. This aggressiveness, however, is often not due to the CD format itself but rather to the inability of the loudspeaker to deal with the transient information present on that CD. Legends can reproduce the transient information faithfully and without distortion, as stored energy and inertia are controlled, allowing for both analog and digital sources to sound smooth, rich, detailed and without aggression. Q: Phase linear, pulse correct, transient distortion free, omnidirectional, virtual point source, full frequency range, high power and dynamics, build-in phase linear subwoofer,…. It all has been done before. What is so special about your system? A: The special thing is to have these all together at the same time under a single roof. This is needed because our human hearing system is very good at detecting any error in sound reproduction and easily classifies sound as ‘not real’ if anything is missing or wrong. For the magic to happen, ALL these features must be present simultaneously in the same device. What use is a speedy car if the breaks are no good? But a car with good breaks and a lousy engine isn’t much fun either. It needs to work all together at the same time for it to be really good. We are not aware of other products that achieve such a total, complete, holistic approach. Legends perform exceptionally well in all these fields, and each special performance is true for the entire frequence range, and not just part of it. Q: What has been done technically to achieve this? - Secondary, acoustical crossover: Frequency channel outputs are mixed together again acoustically, inside the cabinet, before exit. This combination of primary and secondary crossover achieves the performance of a single driver, combined with the power of a multi channel system. - Proprietary wave guide and sound reflector to obtain a phase coherent 360 degree fully omnidirectional radiation from a small virtual point. - Specific power amplifiers, one per driver, and close coupled: no components between the output power devices and the driver voice coil, providing again for several fold better membrane control. - Low resonance enclosure, with separate sealed enclosures for each frequency channel. Q: Scientifically / technically very interesting. But what are the listening advantages for me as a music lover? A: The LEGEND Precision Sound Reproducers not only reproduce tones and notes, they also precisely reproduce sound events and noises, also known as aperiodic sounds. As a result, percussion sounds real and detailed and so do the onsets of notes. This is unusual to most listeners. There are also a number of other listening advantages not common to loudspeakers in general: * The listening experience is closer to the concert experience, sounds are more ‘real’. * Transparency and minimal footprint - You do not hear the loudspeakers, you just hear the music. * More information from the recording (from the musicians) is conveyed to you as a listener. * Sonic space may be reproduced: You not only hear the music, you can also hear the room the music was recorded in. * A rich, precise and detailed soundstage image. * Your natural selection filter will allow you to highlight musicians among others in a sound stage image, at your choice. * Due to this you can choose to have a different listening experience while listening to the same recording. * A wide sweet spot: more listeners can enjoy the sound stage simultaneously, more freedom of movement. * A high ‘Spouse Acceptance Factor’ (SAF) as the units are of reasonable size and shape and placement is less critical and no need to 'toe-in'. * Excellent sound in all areas of the room. * Generally no acoustic room treatments are needed. * Reduced listning fatigue - you can comfortably listen for many hours. Q: What does it sound like? Can you try to compare it to anything I might already know? A: The most unusual aspect is that it sounds much more like how real sounds sound. 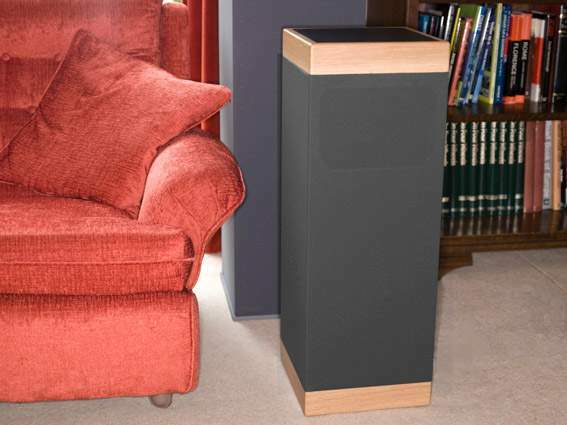 This is quite unusual for loudspeakers so you may be surprised and you may need a short while to get used to that, after which you can enjoy music as if you were at the concert hall, or like if you were in a Jazz club. Closing your eyes makes the illusion more complete as the brain privileges visual information. Some have compared the clarity of the sound to that of electrostatic or panel loudspeakers (as these can also reproduce pulses and phase) but then without the usual drawbacks of size, limited power or dynamics, critical placement, narrow sweetspot or problems with bass. The reproduction of sonic space is unique however, as this requires both the ability to reproduce pulse shapes and phase as well as the omnidirectional point source. We are not aware of any other loudspeaker concept capable of combining these features. The gain in realism is not sublte. It can be noted immediately, often within the first seconds. Q: Will this work with the music collection I own? Or does it require special recordings? A: The system will work with any recording. Given the precision of the LEGEND Sound Reproducers you may be able to better differentiate between recording qualities then before. You will be able to note when recordings contain reduced or damaged time information. To enjoy the best performance of the system, recordings that were less manipulated or less 'tweaked', seem to work best, as these often have better preserved information in the time domain. This includes both recent and old recordings and there are huge quantities of them. We have collected quite some and we are happy to demonstrate them to you and to share our lists of titles with you. But any recording will sound well or better on a LEGEND system, as LEGENDs simply reproduce the input signal very accurately. But when a recording contains less significant time information, then the difference with 'normal' speakers may be smaller, a bit like when you play a B/W movie on a color TV. It will be fine but the new features of the LEGENDs will not show much then. Luckily, however, many existing recordings contain lots of (previously hidden) time information. Q: Will it work with my existing player / amp / room? A: Yes. Most HiFi players and electronics we tested performed quite well, also for phase and impulse. Power amplification is included so you would connect the LEGEND's to the output of a pre-amp or to the pre-outs of your integrated amp. Your HiFi specialist shop can advice you on how to best connect them. Concerning the room: We recommend to keep one meter of free space around the units if, for maximum enjoyment. If room acoustics are good enough to have a relaxed conversation, than it will probably be good enough to listen to LEGENDs as well. Special acoustic room treatment is generally not needed. Q: I own an excellent DAC. Will it's performance be annihilated by your system digitising the signal again? And also: does it work with vinyl discs? A: You will be able to enjoy the full performance of your DAC. Our system is entirely analogue and does not digitise the signal in any way. LEGENDs also work very well with vinyl discs - you can enjoy an entirely analogue signal path without digitasion or chopping anywhere in the chain. The units do not generate any carrier or switching frequencies. Q: Why do you use neodymium magnets? A: Neodymium magnets have stronger fields, empowering the driver motors to better control, higher efficiency and lower transient distortion. Furthermore, ferrite magnets have other drawbacks for precise sound reproduction: ferrite is an electrical insulator which is not optimal for damping and lastly, ferrite allows the magnetic field to move more easily inside the magnet, providing for a less sturdy base for the motor to push and pull from. Q: Your speakers produce powerfull and deep bass in relation to their size. How is this possible? A: For bass reproduction we use air compression in a sealed enclosure, complemented by proprietary equalization. You may have noticed a few bookshelf sized active speakers on the market today, which also produce more bass than expected from their size. Here, a similar method is applied, but now in a medium sized floorstanding system. It also results in bass performance comparable to systems 4 or 8 times the size. It makes the LEGENDs bass sound huge, while the units are reasonably sized. Using a steel enclosure further reduces physical size. Further the fast transient response and absence of lag or resonance convays more information to the listener, which can also be perceived as 'more bass'. Last but not least LEGEND speakers are among very few capable of addressing the size estimation detection in our ears with recorded content. As this allows to reproduce sounds 'bigger' than the size of the units, it can be interpreted by listeners as 'incredible' or 'super powered' bass. Q: Why did you make an active system? Is there something wrong with a good external amplifier and passive cross-over filters? - Passive crossover filters often cause frequency dependent delay (and so do some less perfect active filters as well). This causes pulse shapes to be reproduced incorrectly. It can also cause subtle phase information to become damaged or lost. - Passive crossover filters introduce resistive elements in the final loop between the amplifier and the driver voice coil. This damages the control (damping) capacity of the amplifier, compromises membrane control and transient reproduction. - Resistive components in the final loop also cause important losses in power. The 300W amplification in a LEGEND produces more dynamics than the equivalent of 600W or even 1200W in some traditional systems because it is close coupled: there are no losses in filters or cables. And because the amplifiers now can achieve high SPL with much less electrical power, distortion is lower too. - With passive crossover filters, the voice coil itself becomes an actual component in the filter circuit. This causes the filter charateristics to change with the temperature of the voice coil. As voice coil temparature changes can be quick and important during operation, this can cause unwanted dynamic changes in the characteristics of the filters. - Passive cross-over filters may allow feedback current from one channel to flow into an adjacent channel. With separate amplifiers, this risk is eliminated. - A separate amplifier for each frequency channel allows to optimize each power amplifier for the transducer it is driving and for the frequency range at hand. The needs for amplifying HF (high speed) an LF (high power) are different and performing both at the same time is a challenge: When high currents are flowing due to a bass wave, keeping fast and precise treble information on top of that, undistorted, can be hard. In a properly conceived active system these difficulties are avoided alltogether and compromises uncalled for, as force and speed are now handled each by separate circuits, excluding risks of interference. Q: I am interested. Where can I listen to them? A: This is all quite new. The LEGENDs were launched only recently and it takes time to build a distributor network. At this time we have a dealer in Brussels, Belgium, where you can listen to them on request. Negotioations are under way for France, Germany, The Netherlands and Luxemburg. More will follow soon after. We are also keen to do demonstrations during events. If you are a member of a HiFi club, please feel free to contact us and we are happy to come to your club with a pair of Legends to demo them and explain about the concept. Also have a look at this site from time to time to see where and when LEGENDs are presented at HiFi shows. Q: I know this may not be relevant to sound, but since I am curious, can I please see a picture of the system without the cloth? A: Curiosity killed the cat! But sure here you go for a picture taken during manufacturing :-). Q: You made the enclosures from steel? I have never seen that before. Why didn't you use wood or aluminium like most others do? A: Steel is very sturdy and therefore can be thin in comparison to other materials, for the same rigidity. For a given exterior size we now can have more air inside, which in part explains the relatively small size of our units compared to the size of the sounds they can reproduce. Q: I am convinced! Where can I buy them? Texts on this page were written by and are copyright Kommer Kleijn.